We had been trying to select Fukushima children who can attend the 2017's Summer program, and the application reached beyond the capacity and we closed the acceptance today. We still continue funding as we need another $23,000 to accomplish our mission this year. Thank you for your interest, compassion and action for Fukushima children who need our global support for healing and learning. More than 80 children are now suffering from thyroid cancer which could have been prevented if there was no nuclear accident in 2011. The radiation level in some parts of Fukushima are still high and food they eat also has some radiation that can bio-accumulate, which is our concern. Yes, tonight, it is happening from 6:30pm. An amazing dancer from NY, Shizuno (who now live in Volcano) and a singer from Hilo, Kauilani Trainer, flutist Yumi, piano accompanied by Annu Shionoya, performs "Prayer for Fukushima" at Hawaiian Queen Coffee Garden , across from Safeway in Kailua Kona. 5 years since the earthquake, tsunami and nuclear disaster that attacked the east part of Japan, taken 18000 peoples lives instantly, and now, we face the growing number of children with thyroid cancer (as of Jan 2016, 166 children have been diagnosed or suspected). Fukushima Kids Hawaii continue to support those children who still live in Fukushima, being exposed to radiation day and night by inviting them to Kona for 1 month of healthy respite. Your concern and support is greatly appreciated. 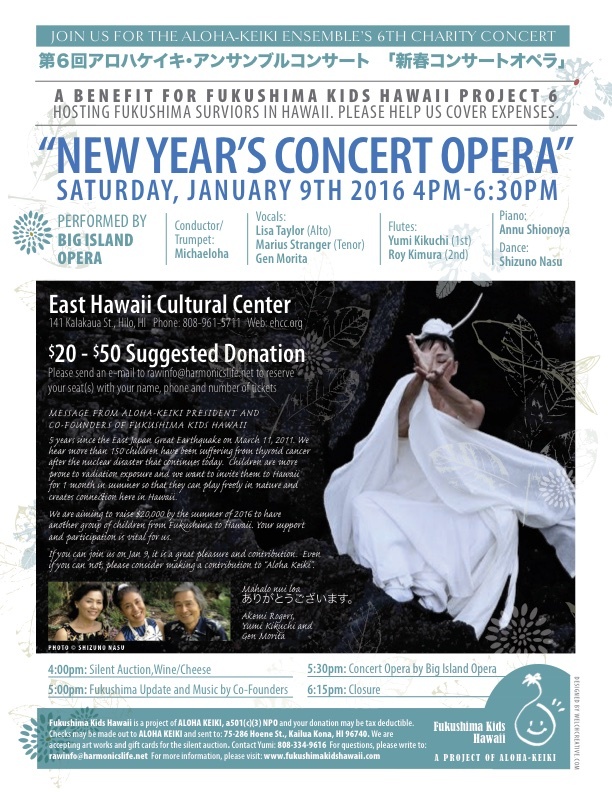 Tomorrow, Jan 9, 2016 at 4pm, we are going to have New Year's Concert Opera @East Hawaii Cultural Center. Here is the flyer. I am not as well connected as I want to be in Hilo and challenged to get participants!! If you know anyone in Hilo, please share this post. If you live near Hilo, please come. 10 of them arrived safely, and having a great time here. Below are some photos. More on Japanese FB page, Fukushima Kids Hawaii Japan. They are age from 10 to 16, learning how to farm, harvest, cook from the scratch using the harvest, cleaning, doing laundry, washing dishes, tidying up after every activity, learning BePeace Practice and Harmonics Healing (Japanese natural healing method). Indeed, the best program we have had so far. From Project 5, we decided to make our main focus to "Learning" and this summer's main theme is "Farm to Table". So, our meals are made from scratch using fresh, organic and local vegetables, fruits, fish, eggs and meat. Great, isn't it? Our ultimate purpose is enhance the wellbeing of the children affected by nuclear power plant explosion in Fukushima. They have been living in and exposed to radiation constantly since March 11, 2011. Yesterday, Mayumi Oda invited all of us to her Ginger Hill Farm and they provided feast lunch and dinner for us almost all made from their farm. A Former Holualoa Cafe chef now lives with her and cooks great meals. Which is another blessing. Hope you are doing well wherever you are on this planet Earth! Upon Akemi's request, I am sending some photos. More are in the FB of Fukushima Kids Hawaii page. They learn how to farm, harvest, cook from the scratch using the harvest, cleaning, doing laundry, washing dishes, tidying up after every activity, learning BePeace Practice and Harmonics Healing (Japanese natural healing method). Indeed, the best program so far. I selected some photos I took from Fukushima Kids Hawaii Project 5 "Summer School@Huehue Ranch". Finally I have a bit of space to do this. Today, we are going to fundraise by Garage Sale at Fukushima Kids House. If you happen to live in Kona, please come and support our mission by buying something you need or making donation. All the kids will be there from 9 am to noon. Bananas are from Huehue Ranch and Ginger Hill Farm. Lycées are from Ikea-san, who is in charge of Meet N Eat. Rice and Beans with Daikon leaves and sesame seeds. Delicious. Ample salad with each meal. Even dressings are made from scratch each time. Off course, miso soup with seaweeds (wakame, konbu) and a lot of root vegetables like daikon, carrots, sweet potatoes etc. 10 people from Fukushima are here (July 21 till Aug 19) for Fukushima Kids Hawaii Project 5 "Huehue Summer School". In the school, they learn how to farm, how to harvest and cook meals from the harvest, to practice BePeace, to learn about Harmonics Healing (natural healing method based on Kai-Igaku from Japan), and to learn different Hawaiian traditions. This is only the 4th day and we have done so much!! To cover the cost of hosting 10 people for 1 month here in Hawaii, we are still short $8000 for this summer's program. We plan three more fundraising effort. Your support of spreading this information is greatly appreciated. We can continue our mission only with your cooperation. 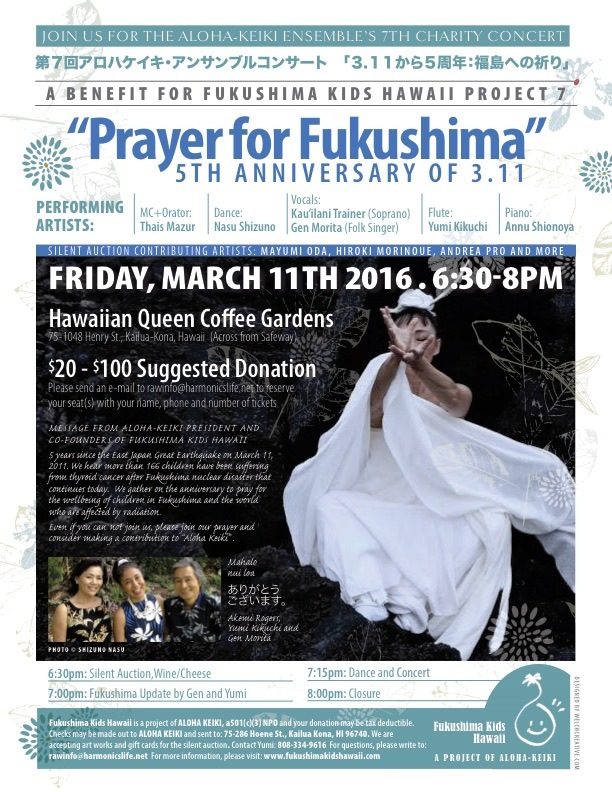 I just launched the IndieGOGO campaign to help Fukushima Kids Hawaii Project 4. Hope you can share this site to your friends so that we can reach the goal. By donating to our campaign, you are helping health and lives of Fukushima children directly and you are also contributing raising awareness of general public about radiation and health (there are a lot of things we can do to enhance our immune power despite the environmental contamination, including radiation, which we will teach Fukushima children). The respite from radiation exposure is very important and benefitial for the health of the children living in radioactive environment constantly. • The 12 Fukushima children age 9 to 18 will be coming with 2 chaperons, and their experience in Hawaii will impact rest of their lives as they will be equipped with the knowledge of Japanese natural healing method and natural food (including how to prepare the food). They will be give Kangen water daily for detox and revitalize. • We have managed 3 programs so far successfully, with 48 people (32 kids and 12 adults) attended our summer/winter programs (20 people) or stayed at Fukushima Kids Hawaii House(28 people) as of Oct 2014. Your support is greatly appreciated. Mahalo, mahalo!